Checking line length - what's in a few mm? This whole thing may entirely not matter, and I suspect that's the case, but I'll ask away! I'm checking line lengths, and inconveniently my lines either end in loops or knots with no easy way to attach all 4 to a single point (unlike, for example, Ozone lines). I'm using small loops to attach to each line, then anchoring those. For the knot ends I'm just attaching the loops like I would a kite. For the loop ends (steering lines for me), I can either leave the loop fully open, or use the loop like I would on a kite, which shortens the lines a little. This doesn't matter when checking steering line to steering line, or front line to front line. But how about checking steering line length vs front line length? It does matter when you are checking the line lengths for tuning that they are all attached evenly. 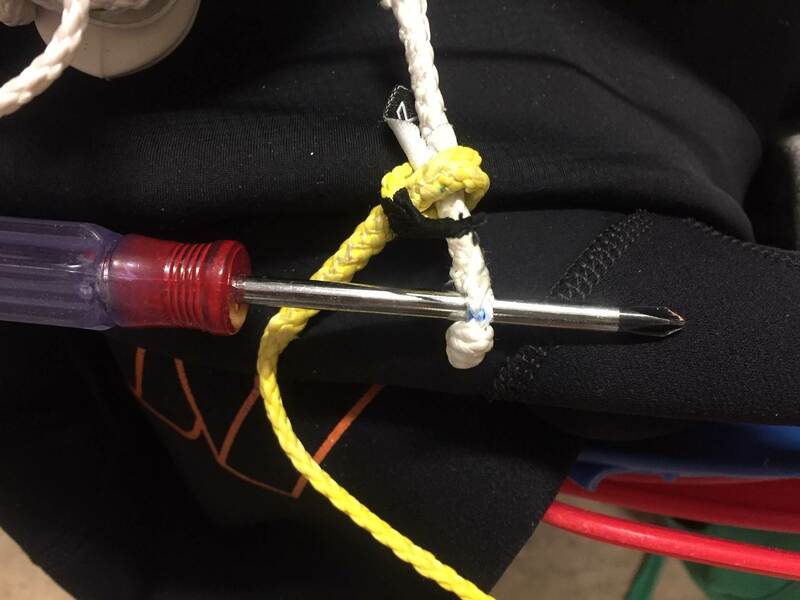 Some lines are easy to attach using a screwdriver or your safety leash, but that's not always possible as you mentioned above. Your methods works you just need to take into account the small difference in length during your tuning. Well that's a very handy device Christian. I've used a big screw driver and just put it through the loops that the pig tails are attached too when checking my line's solo. Work's fine. With north/duotone click bars you have the option of changing the pigtails between 20cm, 25cm, 30cm and 35cm. At the moment my bar seems to want about 27.5cm pigtails for the centre lines, any other option here? Or just close enough is good enough kind of thing? Well I learned there's a workaround built in: this location for all 4 lines. But it assumes the remainder is unadjusted. fiddly if it needs adjusting. This means I need to do the RED text in my first post. Use the loop as usual, which shortens it a little, but that has to be done for equal line lengths. Cignify, this may help you: I saw a video where they put their full weight on individual lines to stretch them out to get equal line length. 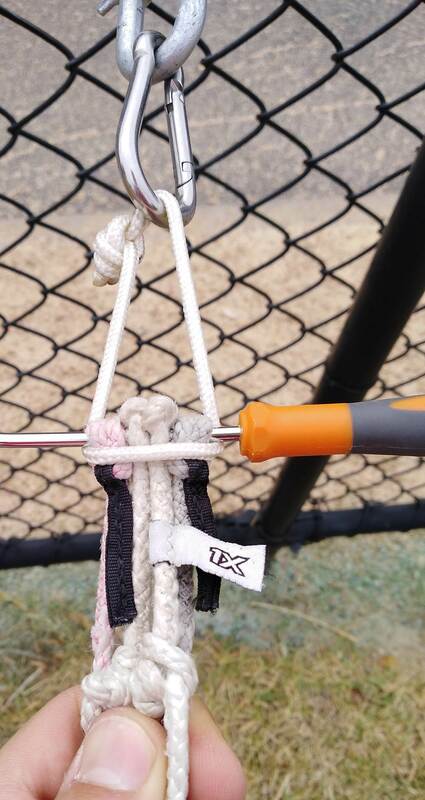 Perhaps you can do this, or just tie a small knot somewhere to shorten the line. Yes you can stretch lines by pulling hard using your weight but not sure how long that lasts, maybe enough for the next session. Usually i find one rear line is looser than the other so is probably good practice. If the two front lines are uneven then I'm not sure what the flock to do. Thank you for allowing me to share my deep knowledge of Cabrinha products, please send me a free kite now. In this case, it doesn't matter how you connect them! All modern bars have the same ending (whether it is loops or knots) on both centre lines and the opposite ending on the steering lines. 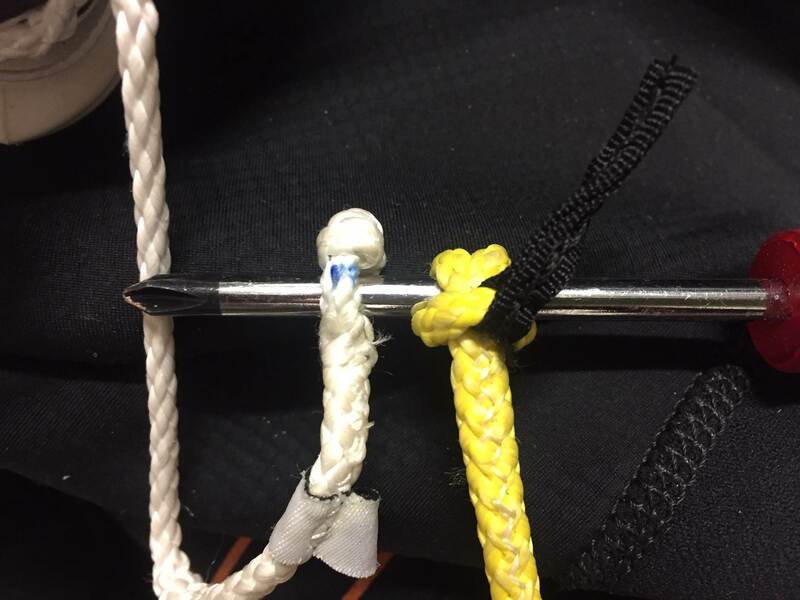 As long as both centre lines are exactly the same length, both steering lines are the same length, the 40 plus cm of bar throw will make the few millimetres of difference between the front and back lines irrelevant. Literally did this two weeks ago. 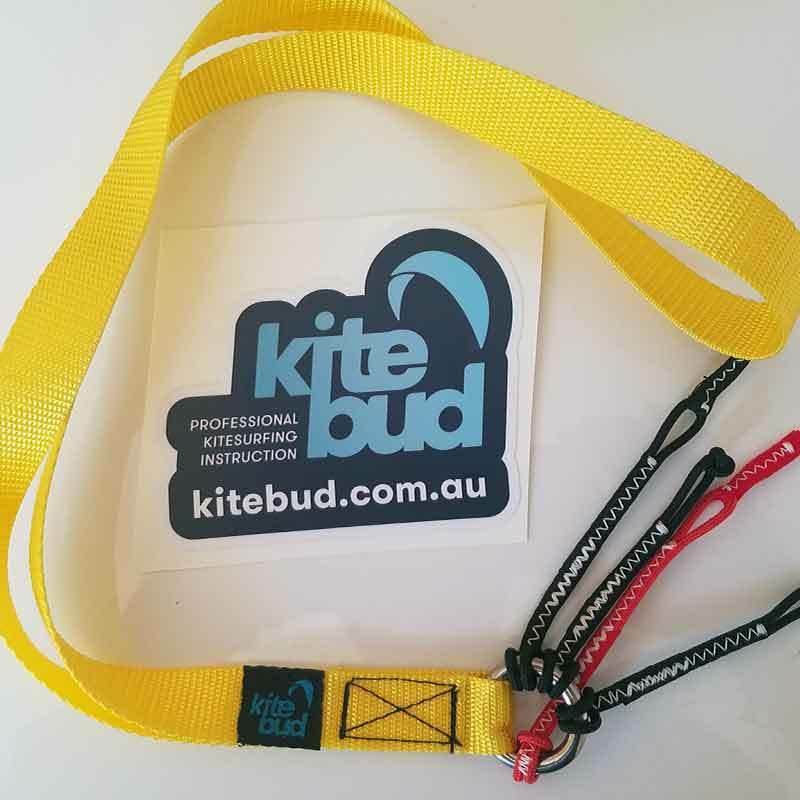 4 year old kite, started flying really average. Let someone else kite it, who told me it was fked. Lines were out by about 4 inches. lengthened the steering lines and shortened the middle to try even out. What's in a few mm? That was the original question and as per usual it got a little side tracked, but that can be a good thing. Answer is .... nothing, don't worry about a few millimetres. 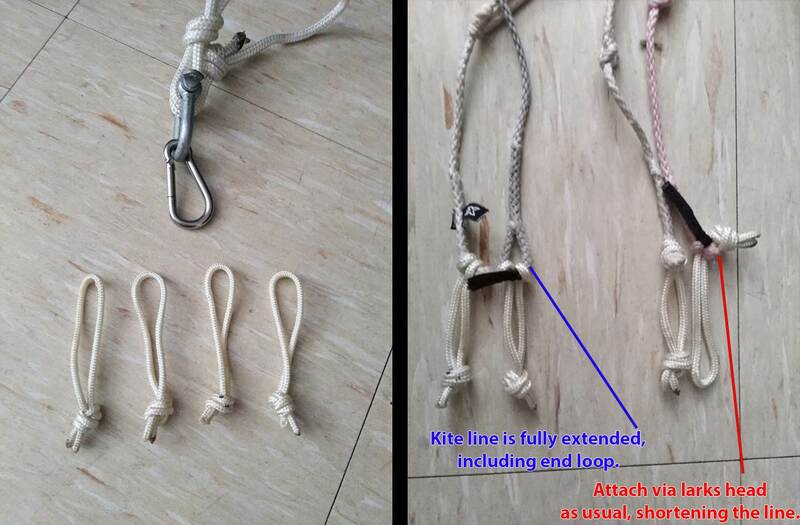 Remember this: Your kite may not be absolutely perfectly symmetrical. You have usually three attachment points on your steering lines, all varying by more than a few millimetres. ( so obviously the front lines and steering lines do not have to be equal length exactly) . The kite is almost never held stationary and you probably have not got an inbuilt spirit level in your bar or hand so you are probably holding the bar slightly skew anyway. Now a few centimetres or inches that's a different story. I will go to a lot of trouble to make sure my Front lines are exactly the same length. Ill try and get my Back lines close to the same length as each other as I can. 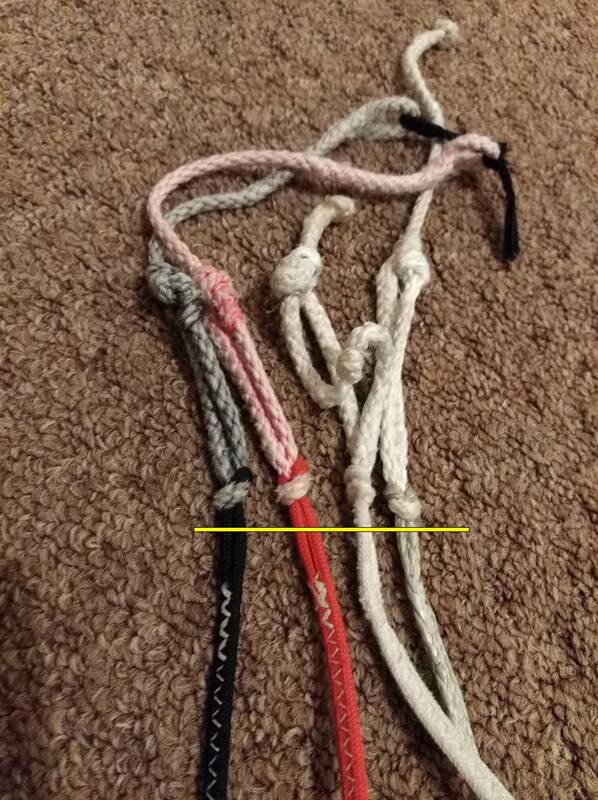 Here's a pic for those with Cabrinha lines or similar, and also a link to a video that's probably the best I found to explain how to test line length. Fly on da wall said..
What I wouldn't do for a few extra millimeters.